Listen to any Salsa song and see why this dance can be so addictive! The complex rhthyms and drum beats pulsate through your veins and you cannot help but feel pure happiness and enjoyment from the get go! Whether your from China or Ireland or French, whether your 5 or 60 years of age, black or white, it doesn't matter, Salsa concurs ALL! It's one of the most popular dances around the world now and you can dance it on a social basis for fun or perform it on a competitive level. ETOWN SALSA can take care of you from your baby steps and educate you through the way. Check out below what we have to offer. Partnering technique including how to cue. Dance etiquette on the social dance floor. SALSA LEVEL II -This level is where most students spend their time practicing foundation and progressing to a more comfortable level. Initially leaders will find it more challenging and so the learning curve is more difficult but also more rewarding in the end. It is recommended to combine your learnings with practice at any social dancing events in order to progress. Note: N.Y. Style is recommended for performance level training. Continued leading and following techniques. More challenging combinations and patterns. More Partnering techniques including how to cue your partner and when to cue. Beginner styling for men and ladies. Introduction to Shines and implementing in pattern work. SALSA LEVEL III -This level requires a good understanding of leading and following and you are implementing some styling to your dancing already. You should have at least 1 year of social dancing experience in order to keep up with this level. Advanced styling for men and ladies. 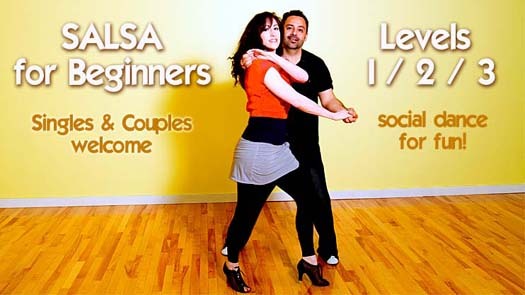 SALSA LEVEL IV -This level is ideal for those that would like to perform. In order to be at this level, you either have to go through our levels and be recommended or you would do a 1 on 1 audition in order to see if you will make the team. Copyright © 2011-2019 ETOWN SALSA Dance Company. All rights reserved.